Eyes to the ground. Each step brings a new texture, mostly curious, sometimes treacherous. It may be the relentless subzero temperatures striving to shear layers of stone from the bedrock of paving slabs or tease river pebbles from their concrete casings that has worn the street into new topographies. The stairways of city spaces, already eroded by the footfall of what Winston Churchill called “too much history”, become mirror-like slides in winter with no trace of their treads. Some hard-wearing boots have chipped makeshift steps into one corner of the flight; at the other edge, a lady begging for money sits on her cardboard mat and holds out her hands to passers-by, not for spare change but for their assistance. At other times in the year, gaping holes the size of upturned umbrellas appear and are soon filled with the dust and, later, mud of the city. In places, asphalt has been pounded and peeled to reveal a black void where you would expect something – sand, maybe, or rubble. An illusion of infrastructure. These pits collect the plastic detritus blown by the wind, until some local newspaper publishes a parody. Someone fills the pit. But within days the surface begins to sink tellingly. Molten tar on a bed of chocolate wrappers. “Welcome to Kosovo!” they all repeat with resigned shrugs. Of what relevance are these magnified everyday observations to a country that has experienced trauma periodically for centuries? Kosovo. The name conjures up newsreels of NATO bombings, blue helmets and peacekeepers, lines of refugees streaming across borders. Ethnic cleansing. A war zone. A half-memory on the other side of Europe, collaged from assumptions and familiar filmic stereotypes. Somehow linked in the mind’s eye to Rwanda and Srebrenica. Balkan-: our prefix for chaos, barbarism, and fracture. Yet there is little physical evidence of the conflict in Prishtina, Kosovo’s capital, and the few tourists who pass through hoping to see some “war stuff” in the city are often disappointed. Destroyed buildings remain in rural areas, mostly now crippled concrete frames harvested for bricks, windows and other fittings. Modest triangular signs sway on razor wire alluringly entwined with brambles, marking UXO (military, now street-speak for Unexploded Ordinance), recreating a lush habitat amongst an otherwise malignant landscape. Tumult manifests itself differently in the city. The street – ground level, the arena of the everyday, following De Certeau’s footsteps – is always more telling. Some cities can be read through their masterplans, mostly by the trained eye, but few can be properly understood that way. The ambitions and egos of architects and planners leave their mark, straining towards the utopian, patching obvious parts of the city puzzle, monument-making, politics in concrete. For all that the proliferation of building in Kosovo attempts to communicate in this new country, it cannot be understood strategically, through the architect’s eyes, nor is it a pleasure to behold. It has to be deciphered as a psychological reaction to the upheavals its inhabitants have experienced. It is about war of course (and the subsequent reconstruction of society as much as fabric), but it is also about westernisation, about opportunity – opportunism, too, in the inevitable power vacuums – and about a country that is undergoing all of the social revolutions of the 20th century at the same time within a decade. 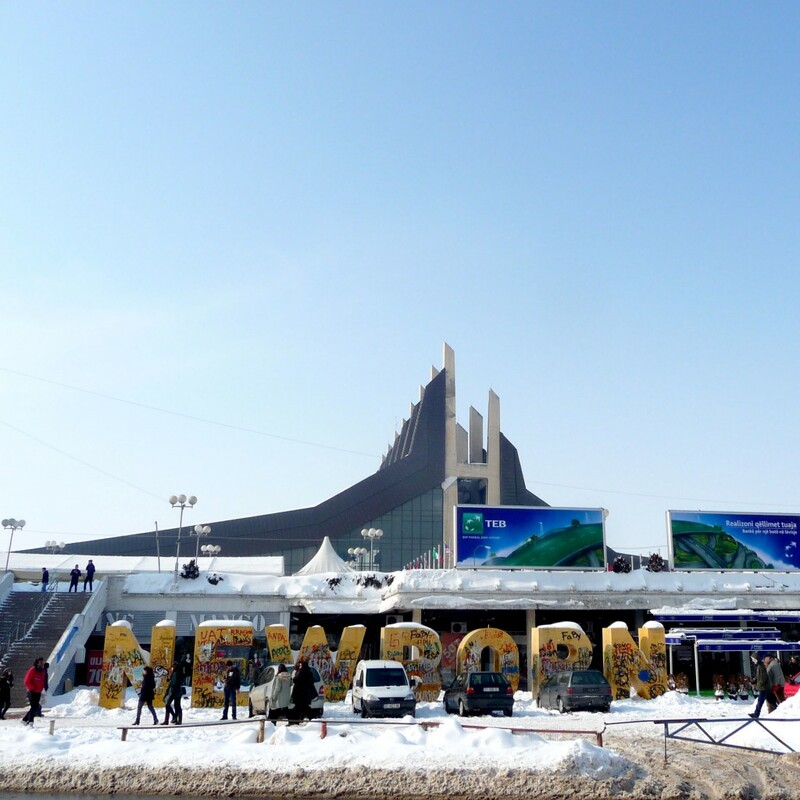 This adolescent city in a “newborn nation” is raw emotion, materialised. 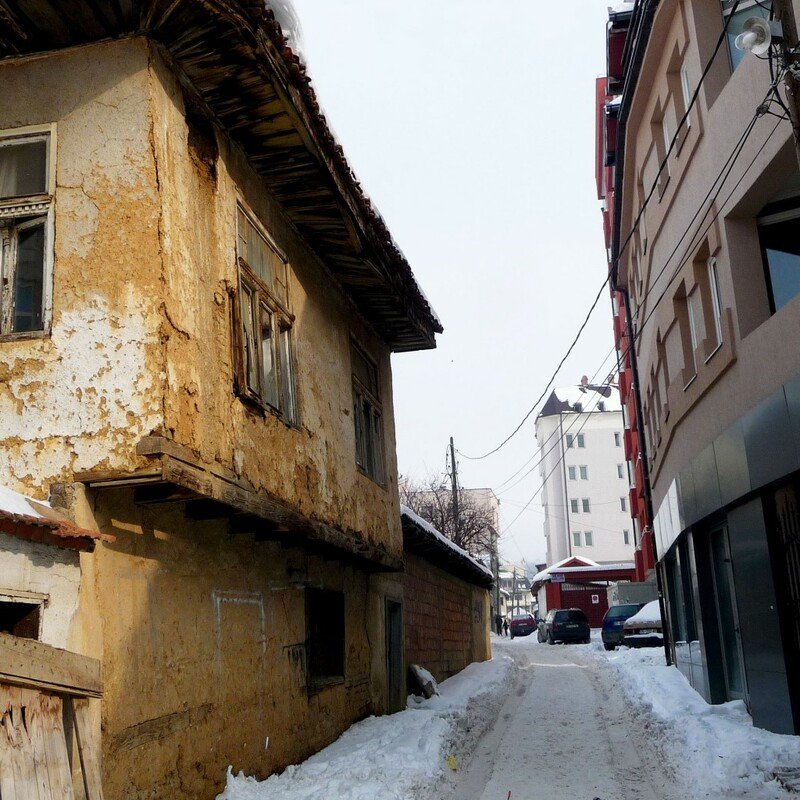 Yet Prishtina is in essence an old city following an old pattern: destroyed, recreated and magnified several times throughout its life, its past still – just – traceable. This can only be understood from the walker’s viewpoint, and from experiencing the patterns and rhythms, customs and beliefs that once created, then shaped, and now colonise these streets. This why I have become a city walker, an observer, in a city where everyone is an architect with free rein. It is why Prishtina, in all its gracelessness, continues to entice, revealing more of its character through everyday journeys. The old town emerged from two main roads during the 13th century on caravan trade trails that stretched between the northern Adriatic (Venice, Dubrovnik/Ragusa), Constantinople and the Middle East, little more than a resting point between empires. The hub of activity was naturally the bazaar, around which disparate housing areas unfolded to form a number of small, stable settlements where extended families lived in close proximity, each generation adding to the core house compound. The surrounding contours generated awkwardly-shaped plots and private enclosures which contained a jumble of houses, stables, yards and guesthouses. These irregular clusters eventually linked together in a dense urban grain, giving form to the city and laying a pattern of aggregative development that has in many ways been inherited today, although almost impossible to discern through fleeting experience. Meandering between these annexed compounds were narrow dirt lanes lined by the blank walls of stone and mud which delineated clans and harboured the private life of the family from the muddy mayhem of the street. Echoing Islamic paradise-garden architectural compositions and undoubtedly inspired by the fashions of the Ottoman administrators at the time, gardens filled with fruit trees and flowers blossomed behind these street walls, the tops of branches, just visible, tempting the passer-by. Water trickled into shallow stone channels running through each plot, sometimes emerging grandly from a carved brass or marble spout, or percolating through to the neighbour’s house beneath paving stones. These oasis-yard spaces still exist in Kosovo, although few remain in Prishtina. They are protected jealously –following tradition, in fact – and barely seen without an invitation to step over the raised wooden threshold into the garden beyond. Thus the street, as a utilitarian thoroughfare, was rarely graced with the romantic social or cultural attributes of the western European city street and the features this brought. It was a receptacle for everything and everyone outside, set apart from the inner world of the house and garden compound; tough and durable, it contrasted with the devoted care and cleanliness within where the threshold was manically swept of dust, mud or snow; finely woven carpets bearing strong, geometric patterns were beaten over first floor balconies several times a day; a line of shoes, removed at the door, and replaced with thick woolen house slippers, greeted the guest. On the way out, shoes would have been cleaned, straightened and laid out courteously to ease the departure. A popular interpretation for the etymology of Balkan is the ‘land of blood and honey’, a conjoining of Turkish words that suggests a fierce reputation tempered by unbounded respect, generosity and hospitality. For all that the city was, and has become, this is the thread that weaves through Prishtina. The city street is a triviality compared to the enveloping, almost sacred, microcosm of the house. Despite the efforts to remake and to recreate Prishtina’s fabric throughout history, this concept of the family household as a core, a regenerative nucleus within the city, brings some understanding to the chaos of the contemporary city. Socialism brought a powerful new spatial approach yet it also – perhaps unwittingly – embedded this intangible heritage. Prishtina remained an unexceptional provincial town until the 20th century when it was designated the focal point of administration and much of its old fabric was lost under the planners’ motto of ‘Destroy the Old, Build the New’. Squares to heroes, to Brotherhood and Unity, were shaped from the rubble of old markets. The low, old houses of stone and mud were razed to make way for the wide planning and commanding proportions dedicated to the worthy workers and their families. The street was still not a place for the citizens but for ideology, and later for demonstration and protest. Yet the tight warren of roads continued to multiply out of view. Passages and alleys, a score of entrances and shortcuts leading to a denser, more familiar experience of the city, were embedded within and around rectilinear concrete blocks. Even today, the real streetlife still occurs perpendicular to the street, disguised, and all the more vital for it. Streets whose names and languages have changed five times in a generation have now had their signs pilfered to sell for scrap metal. Wayfinding in the city relies on the everyday markers and moments of the past. Uncle Zeka’s mill (for a river that has been covered by concrete for forty years); Baba Bekteshi’s teahouse; the Cana family butcher: these constellate to form a collective cognitive map of the city for pedestrians and taxi drivers alike. An A-Z is irrelevant and largely useless. Since the war in 1999 the scale of change has been different. The winding streets and haphazard arrangement of plots and buildings have been acquired, bequeathed and entrenched within the confusion of setting up a country from scratch and in the power shifts of the so-called Transition. (Few can actually qualify what this really means; for now, it remains the reason for vast international donations and ‘advice’). 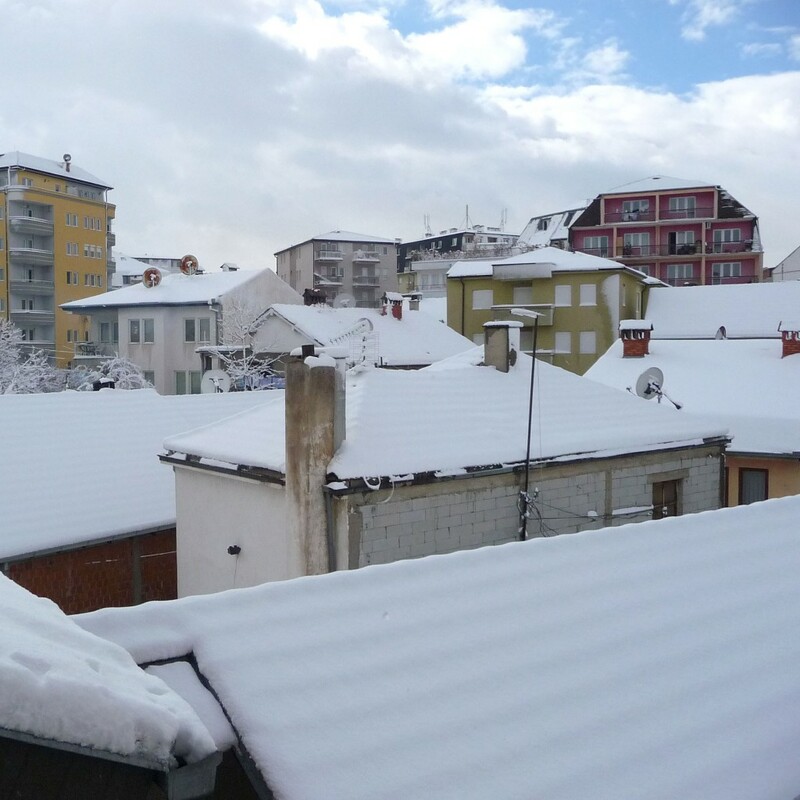 A wealthy diaspora returning each summer – the schatzi, Kosovo’s darlings – pile together with rural migrants, the legion of foreign aid workers labelled “the internationals”, young couples and students. Canny individuals capitalise on this with solid, looming cubes of profitable floor area crowned with layer upon layer of clumsy ‘mansard’ roofs, making a mockery of any form of planning or regulation, structural logic or safety. Clustered together these blocks form bizarre compositions, accidentally mimicking the elemental arrangement of the old city at sky level. Trees no longer exist in Prishtina, except in the gardens of old houses whose owners have not yet sold out, still unreachable. Perversely, this can be appreciated only from the upper storeys of new blocks, balconies providing grand views over the city to its ring of hills while screening neighbours from the panorama. The street is now the base of a cavern, sided by naked concrete frames awaiting a phantom economy. Or it is lined with mirrored glass, aspirational yet hostile, reflecting the detached glances of passers-by. But as dismal as this freshly sketched street is – the streets of this fledgling country – the regular reassertion of old customs in new locations are harder to dismiss. It is too soon to say what legacy this street will leave. For now, with a certain charm, rugs are still whipped every morning, through sun and snow, from sixth floor balconies. Shoes await their owners by front doors, whisked away and cleaned by children who know from a young age how to receive guests. Shops take pride in their patch of pavement, a permanent extension of the ‘Welcome’ mat; some lay marble tiles, others amateurishly pour concrete or lay bricks, a patchwork underfoot always enlivening the journey. In winter, neighbouring shopkeepers share shovels, chipping ice from their thresholds and mopping the pavement. The same happens to the dust and mud of summer as it whisks irritably into the gutter. Stepping over the threshold, out of the street and into the home, is to step into an entirely different domain. The walker arrives at the front door, and a household flurries to rearrange itself around the guest.